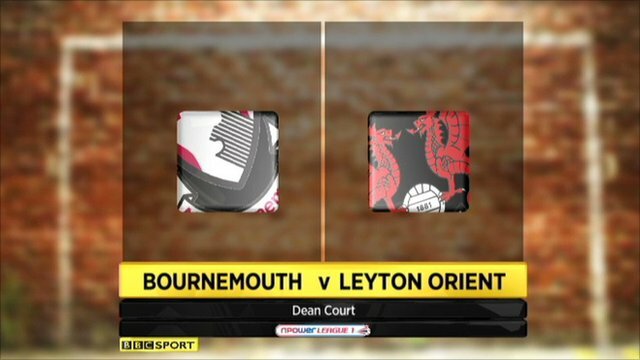 Dean Cox's late equaliser earned Leyton Orient a point against Bournemouth and extended their unbeaten run to eight league games. Michael Symes gave the Cherries the lead shortly before half-time after picking up Marc Pugh's through ball and slotting past Jamie Jones. The O's were dangerous on the break and Jonathan Tehoue forced a save. And Cox earned Orient a draw in the final minute when his cross-shot flew over the head of Shwan Jalal. "We had our chances to win. I thought we may have gone on to get another one. "Their goal was a sucker punch. It's hard to take when you're on the receiving end. "I'll pick the lads up and we've got a couple of big games coming up now." "I'm delighted with the resilience and the attitude of the team again, I think they started really brightly. "It's a great point. I thought we carved them open. There were one or two nice openings in the second period. "We had greater control of the ball in the second half but we didn't punish them." 94:06 The game is over, as the referee blows his whistle. 90:00+2:33 Unfair challenge on Danny Hollands by Stephen Dawson results in a free kick. Free kick crossed left-footed by Warren Cummings. 90:00+1:45 A cross is delivered by Warren Cummings. 90:00+0:34 Substitution Michael Symes leaves the field to be replaced by Steve Fletcher. 90:00+0:05 Substitution Ben Williamson is brought on as a substitute for Danny Ings. 89:10 Assist by Stephen Dawson. 89:10 GOAL - Dean Cox:Bournemouth 1 - 1 Leyton Orient Dean Cox gets on the score sheet with a goal from the edge of the penalty area to the top left corner of the goal. Bournemouth 1-1 Leyton Orient. 88:55 A cross is delivered by Charlie Daniels, clearance by Shaun Cooper. 86:45 Stephen Dawson takes a shot. Comfortable save by Shwan Jalal. 85:35 Charlie Daniels sends in a cross, save by Shwan Jalal. 83:27 A cross is delivered by Dean Cox. 83:05 Anton Robinson takes a shot. Andrew Whing gets a block in. 82:28 The ball is crossed by Marc Pugh. 82:00 Michael Symes gives away a free kick for an unfair challenge on Andrew Whing. Jamie Jones restarts play with the free kick. 80:18 Foul by Thomas Carroll on Michael Symes, free kick awarded. Shaun Cooper takes the direct free kick. 79:38 Michael Symes delivers the ball, Danny Ings takes a shot. Comfortable save by Jamie Jones. 79:32 The ball is crossed by Danny Hollands. 78:07 Corner taken by Marc Pugh from the left by-line played to the near post, Danny Hollands concedes a free kick for a foul on Jimmy Smith. Jamie Jones restarts play with the free kick. 77:54 Danny Ings takes a shot. Jamie Jones gets a block in. 76:06 Handball decision goes against Anton Robinson. Jamie Jones takes the direct free kick. 76:00 Centre by Marc Pugh. 75:24 Outswinging corner taken by Warren Cummings from the left by-line played to the near post, clearance by Elliot Omozusi. 74:48 The ball is swung over by Andrew Whing, Jason Pearce manages to make a clearance. 72:42 The official flags Stephen Dawson offside. Shwan Jalal takes the free kick. 72:42 Substitution Thomas Carroll joins the action as a substitute, replacing Jason Crowe. 72:42 Substitution Paul-Jose M'Poku goes off and Scott McGleish comes on. 72:04 The ball is delivered by Liam Feeney, Alex Revell makes a clearance. 71:25 Marc Pugh takes a outswinging corner from the right by-line to the near post, Jimmy Smith makes a clearance. 70:48 Michael Symes takes a shot. Save by Jamie Jones. 70:36 The ball is swung over by Jason Crowe, save made by Shwan Jalal. 68:02 The ball is swung over by Adam Smith, clearance by Andrew Whing. 67:25 Anton Robinson delivers the ball, save by Jamie Jones. 66:29 Danny Ings fouled by Jimmy Smith, the ref awards a free kick. Direct free kick taken by Shaun Cooper. 65:49 Danny Ings takes a shot. Andrew Whing gets a block in. 65:17 Jason Pearce sends in a cross, clearance made by Elliot Omozusi. 65:03 Stephen Dawson delivers the ball, clearance by Adam Smith. 60:37 Unfair challenge on Jimmy Smith by Michael Symes results in a free kick. Terrell Forbes takes the free kick. 60:37 Substitution (Leyton Orient) makes a substitution, with Alex Revell coming on for Jonathan Tehoue. 59:08 Free kick awarded for an unfair challenge on Michael Symes by Stephen Dawson. Shot comes in from Marc Pugh from the free kick. 57:42 The ball is sent over by Terrell Forbes. 57:13 Inswinging corner taken from the right by-line by Charlie Daniels, Michael Symes manages to make a clearance. 56:13 Free kick awarded for an unfair challenge on Paul-Jose M'Poku by Danny Hollands. Charlie Daniels delivers the ball from the free kick left-footed from right wing, Danny Hollands makes a clearance. 54:37 Charlie Daniels has an effort at goal from just outside the box which goes wide of the left-hand upright. 54:17 Marc Pugh produces a cross, Stephen Dawson manages to make a clearance. 54:06 Charlie Daniels takes a shot. Blocked by Jason Pearce. 50:35 Centre by Paul-Jose M'Poku, comfortable save by Shwan Jalal. 50:21 Unfair challenge on Liam Feeney by Charlie Daniels results in a free kick. Free kick taken by Shaun Cooper. 49:47 Free kick awarded for a foul by Anton Robinson on Stephen Dawson. Direct free kick taken by Andrew Whing. 48:38 Andrew Whing sends in a cross. The referee blows for offside against Jonathan Tehoue. Direct free kick taken by Shwan Jalal. 46:44 Inswinging corner taken by Dean Cox, Terrell Forbes has a headed effort at goal from deep inside the area missing to the right of the target. 46:31 Jonathan Tehoue takes a shot. Save made by Shwan Jalal. 45:20 A cross is delivered by Danny Ings, clearance by Andrew Whing. 45:00+1:00 The players leave the pitch at half time. 45:00+0:49 The ball is delivered by Adam Smith. 45:00+0:03 Free kick awarded for a foul by Jonathan Tehoue on Danny Hollands. Jason Pearce takes the direct free kick. 43:53 Centre by Dean Cox, Jason Pearce makes a clearance. 38:51 Assist on the goal came from Marc Pugh. 38:51 GOAL - Michael Symes:Bournemouth 1 - 0 Leyton Orient Michael Symes finds the net with a goal from just inside the area to the bottom right corner of the goal. Bournemouth 1-0 Leyton Orient. 38:33 The ball is sent over by Charlie Daniels, Jason Pearce makes a clearance. 37:08 Inswinging corner taken from the left by-line by Marc Pugh. 37:01 Warren Cummings produces a cross, blocked by Andrew Whing. Correction - 35:58 Shaun Cooper sends in a cross, save made by Jamie Jones. 35:58 Shaun Cooper crosses the ball, Jamie Jones makes a save. 34:38 Jonathan Tehoue has a header from close in and clears the crossbar. 34:20 The ball is crossed by Jonathan Tehoue. 34:13 The ball is delivered by Paul-Jose M'Poku, clearance by Jason Pearce. 33:33 Foul by Anton Robinson on Jonathan Tehoue, free kick awarded. The free kick is swung in left-footed by Charlie Daniels. 32:17 The ball is delivered by Adam Smith, clearance made by Andrew Whing. 30:20 The assistant referee flags for offside against Jonathan Tehoue. Shwan Jalal takes the direct free kick. 29:31 Centre by Andrew Whing, Jason Pearce manages to make a clearance. 28:29 A cross is delivered by Dean Cox, save by Shwan Jalal. 27:22 A cross is delivered by Shaun Cooper, save made by Jamie Jones. 24:02 Corner taken left-footed by Charlie Daniels, Shwan Jalal makes a save. 22:29 Elliot Omozusi concedes a free kick for a foul on Michael Symes. Free kick crossed by Warren Cummings. 21:59 Dean Cox produces a cross, save made by Shwan Jalal. 21:53 Centre by Charlie Daniels, blocked by Shaun Cooper. 21:13 Danny Ings takes a shot. Save by Jamie Jones. 20:07 The offside flag is raised against Jason Crowe. Direct free kick taken by Shwan Jalal. Correction - 19:35 Free kick awarded for an unfair challenge on Elliot Omozusi by Danny Hollands. Free kick taken by Jamie Jones. 19:35 Danny Hollands gives away a free kick for an unfair challenge on Elliot Omozusi. Free kick taken by Jamie Jones. 19:22 Danny Hollands takes a shot. Blocked by Paul-Jose M'Poku. 18:27 The assistant referee signals for offside against Liam Feeney. Free kick taken by Jamie Jones. 16:48 Centre by Warren Cummings, clearance made by Stephen Dawson. 16:34 Liam Feeney delivers the ball. 15:58 Effort from the edge of the box by Danny Ings goes wide of the right-hand upright. 14:22 Paul-Jose M'Poku produces a right-footed shot from just outside the box that goes wide right of the target. 13:25 Marc Pugh has an effort at goal from just inside the box that misses to the right of the goal. 13:20 The ball is delivered by Liam Feeney, Stephen Dawson manages to make a clearance. 13:02 Jonathan Tehoue takes a shot. Blocked by Shaun Cooper. 12:46 Marc Pugh produces a cross, clearance by Charlie Daniels. 11:52 The ball is delivered by Liam Feeney, save by Jamie Jones. 11:06 Effort from outside the penalty box by Stephen Dawson goes wide left of the goal. 10:45 Centre by Liam Feeney. 10:02 The ball is sent over by Charlie Daniels, save made by Shwan Jalal. 8:17 Liam Feeney takes a shot. Save made by Jamie Jones. 7:52 Foul by Andrew Whing on Marc Pugh, free kick awarded. Direct free kick taken by Marc Pugh. 7:52 Booking Andrew Whing goes into the book. 7:21 Liam Feeney delivers the ball. 6:02 The ball is delivered by Adam Smith. 5:39 Marc Pugh delivers the ball, save by Jamie Jones. 4:51 The ball is crossed by Dean Cox, Shaun Cooper manages to make a clearance. 4:21 Anton Robinson takes a shot. Save by Jamie Jones. 2:40 The assistant referee flags for offside against Michael Symes. Free kick taken by Andrew Whing. 1:42 Liam Feeney takes a shot. Jamie Jones makes a comfortable save. 1:00 Corner taken left-footed by Charlie Daniels from the right by-line, save by Shwan Jalal. 0:53 The ball is crossed by Paul-Jose M'Poku, clearance made by Shaun Cooper. 0:18 Free kick awarded for a foul by Danny Hollands on Paul-Jose M'Poku. Direct free kick taken by Andrew Whing.